RM Post and Goes operational – Postage dues paid, VAT accounted for. In an important move in the introduction of self-service automation for customer-facing services, and following on from the temporary placement of exhibition series machines in Crewe and Bradford, yesterday, 9th February saw the A series machines replaced by two new customised RM Post and Go machines, ‘M (or Mailcentre) series’ into Royal Mail’s live operation – and these are not just for Stamp Collectors! 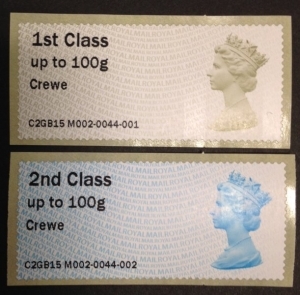 ‘M’ Series machines include additional functionality which allows ‘real’ customers to not only purchase the usual range of stamps but also now pay monies due to Royal Mail, such as ‘Postage Due’, VAT and Customs Duty. Postage Underpaid (These days just inland items are surcharged) where the amount of postage underpaid (or due) is payable plus a surcharge of £1 (So technically the minimum payment is £1.01 , but more typically amounts of £1.20 (£1+73p-53p) or £1.52 (£1+52p) are due. Customs Duty (or more usually VAT) is due on incoming item originating from outside of the EU that has been assessed by HMRC as containing goods over the applicable VAT or Duty threshold. In this case a surcharge of £8 is payable and amounts are typically around order topamax online £15- £20. But now at Crewe and Bradford there is now a forth option available – namely to pay by Credit/Debit card, obtain a Post & Go receipt and then collect your item immediately on production of the payment receipt. In order to use to use the new Post and Go facility, navigate to the required screen (Customs or Postage Due) input the amount due (As shown on the card) pay via Credit or Debit card and obtain a receipt confirming payment. Your item can then be collected from the hatch. The stamps dispensed by M series machines have the office of origin shown ; this is usual for fixed location RM kiosks. In other respects the Kiosks offer the usual range of Post and Go stamps. This entry was posted on Tuesday, February 10th, 2015 at 6:26 pm	and is filed under Dispensed Labels (ATM), Postage Labels. You can follow any responses to this entry through the RSS 2.0 feed. You can leave a response, or trackback from your own site.